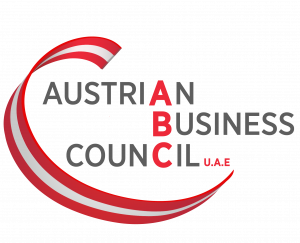 The Austrian Business Council (“ABC”) is a non-profit association governed by the present Articles of Association (“AOA”), the Regulations on the Organisation of Business Councils at the Dubai Chamber of Commerce & Industry (the “Regulations”) and the laws and regulations of Dubai and the UAE. The ABC’s headquarters are located in Dubai. The ABC shall be of unlimited duration. d) to develop links and affiliations with other trade or business groups worldwide; and e) to promote social and sporting activities. e) any other resources authorized by the Regulations. The funds shall be used in accordance with the ABC’s objectives. Only the ABC’s assets may be used for obligations/commitments contracted in its name. Members have no personal liability. Any professional individual person or corporate body of good standing either (i) based in Austria with business links to the UAE or (ii) based in the UAE of Austrian origin and/or with business links to Austria or (iii) upon special approval by the Administrative Board (the “Board”; see Article 11 to 16) may be a member of the ABC. The ABC comprises professional individual members, corporate members and honorary members. The Board is authorized to introduce new levels or kinds of memberships and to determine their rights and obligations. To become a new member of the ABC, an applicant shall pay a joining fee (the “Joining Fee”) and address a request to become a member (the “Membership Request”) to the Board. The Board decides on the admission of new members and informs the General Assembly accordingly; the Board shall have the right to decline any Membership Request. All members shall pay an annual membership fee (the “Membership Fee”) to keep their membership active; such Membership Fee shall differ between professional individual members and corporate members, as determined by the Board. The Membership Fee is due on the 1st February of each year. Membership will be deemed to be inactive if the Membership Fee is not paid within three months of the due date, i.e. by April 30th. Members whose membership has become inactive due to non- payment of the Membership Fee will be required to repay the Joining Fee in addition to the Membership Fee. The conditions for membership, including the Joining Fee and the Membership Fee, its due dates and any consequence of non-payment, shall be determined by the Board, taking into consideration (i) the fees at comparable associations, (ii) the changes in the costs and expenses of running the ABC and (iii) future financial requirements of the ABC. Honorary members may be persons or organizations with an interest in supporting and promoting the ABC’s objectives. Honorary memberships are bestowed by the Board. Honorary members are exempt from paying fees. e) automatically after 12 months of non-payment by a member of the Membership Fee. In all cases the membership fee for the current year remains due. a) the General Assembly, and b) the Board. The General Assembly is the ABC’s supreme authority. It is composed of all the members except for members whose membership has become inactive due to non-payment of the Membership Fee in accordance with Article 5. It shall hold an ordinary General Assembly once each year in Dubai. It may also hold an extraordinary General Assembly whenever necessary, at the request of the Board or at least 10 of its members. The General Assembly shall be considered validly convened regardless of the number of members present, as long as the notification of the members has been effected in accordance with these AOA. extraordinary) at least four weeks in advance. Other items for inclusion on the Agenda must be received by the Secretary General fourteen days prior to the date of the meeting, and he shall advise the final agenda to all members at least one week prior to such meeting. however only in so far as any of the above are included in the final agenda notified to all members by the Secretary General as per Article 7. Each individual member shall have one vote and each corporate member shall have three votes. Except for the election of Board members, votes are by a show of hands; the votes of a representative of a corporate member shall be multiplied by three. If more than one representative of a corporate member is present at a General Assembly, only one shall be authorized to vote. Voting can also take place by secret ballot, if at least ten members so request. Decisions of the General Assembly shall generally be taken by a majority vote of the members present, however, decisions concerning the amendment of these AOA and the dissolution of the ABC must be approved by a two-third majority of the members present. Together with the invitation to the General Assembly in which Board members are to be elected, the Secretary General shall include the names, programs and CVs of candidates who have put forward their candidacy. If there are less than eight candidates, no election shall take place and all candidates are automatically deemed elected to the Board. In case there are more than eight candidates and thus elections have to take place, all members present at a General Assembly convened for that purpose shall receive a ballot paper with the names of the candidates and shall mark the eight candidates he/she wishes to elect. A representative of a corporate member shall receive a differently-coloured corporate ballot paper, and votes cast on such corporate ballot papers shall be counted triple. Thereafter, the Secretary General, under the supervision of the Chairman of the Board, shall count the votes cast for each member and compile a ranked list of candidates. The eight candidates who received the most votes are elected to the Board. A member (individual or corporate) who is entitled to vote but cannot attend the General Assembly, may nominate a proxy in his stead, by notifying the Secretary General prior to the General Assembly who the proxy will be. The proxy must be a member of the ABC (individual or corporate), and shall receive only one proxy on behalf of another member eligible to vote. The Secretary General shall provide a Membership List for the General Assembly, in which proxy holders are registered. The General Assembly is presided over by the Chairman of the Board. The Board is authorized to carry out all acts that further the objectives of the ABC. It has the powers to manage the ABC’s day-to-day affairs. The Board is composed of 9 members, 8 members elected by the General Assembly plus the ninth member, who shall be the Commercial Councilor of the Austrian Embassy – Commercial Section – who shall attend the meetings but shall have no vote. Except for the Councilor, the Board’s term of office shall last for 2 years. The Board meets as often as the ABC’s business requires. The Agenda of the first Board meeting after an election of the new Board members shall include the election of the Chairman of the Board, the Vice-Chairman of the Board and the Secretary General. Decisions shall be made by simple majority vote and a quorum shall be five Board members. In case of a tie, the Chairman shall have a casting vote. The Board members work on a voluntary basis for the ABC. Any elected member of the Board shall be a full subscribing member of the ABC or be employed by a full subscribing member. Every Board member has to participate in at least 2/3 of the Board meetings per year, calculated from such member´s election; otherwise the Board may exclude such member and coopt another member in his stead. The same cooptation right by the Board shall apply in case of resignation, death or incapacity of a Board member. If the number of Board members falls below five, the Board shall call an extraordinary General Assembly to vote new Board members in their position. The paid employees of the ABC have only a consultative vote on the Board. g) to determine the Joining Fee and the Membership Fee. The Chairman of the Board shall a) be an Austrian citizen. d) schedule meetings of the Board as needed; and e) ensure the objectives of the ABC are met. The Vice Chairman of the Board, who shall also be an Austrian citizen, shall fulfill the above duties of the Chairman of the Board if and when the Chairman of the Board is unavailable. i) prepare a report for the Annual General Assembly. The ABC is legally bound by the signature of the Secretary General, who shall only act if a majority of the Board Members has approved a decision. The financial year shall begin on 1 February and end on 31 January of each year. The General Assembly shall appoint an Auditor who will audit the ABC’s accounts every year. The ABC shall maximize the use of technology where appropriate. As such e-mail will be used as the preferred means of communication. In this context any reference to “notify” or “notification” in these AOA shall mean communication by email. Should the ABC be dissolved, the available assets shall be transferred to a non-profit organization pursuing public interest goals chosen by the Board.